Promote utilisation of clinical pharmacological services. Improve and harmonise the teaching of rational use of drugs at both undergraduate and postgraduate levels. Contribute with clinical pharmacological expertise to policy decisions regarding drug regulation in Europe. Arrange scientific meetings, workshops and courses in clinical pharmacology and therapeutics in Europe. Utilise the skills of clinical pharmacology and therapeutics in counteracting misuse of prescription drugs and other chemical substances. Promote problem- and patient-oriented drug information for physicians and other health professionals. Increase input of clinical pharmacological skills in the clinical evaluation of drugs. Promote high professional standards in drug prescribing. Promote high ethical standards in clinical drug research. Enable individual countries to benefit from the diversification of clinical pharmacology and therapeutics in Europe. Encourage collaboration with other agencies interested in clinical pharmacology and therapeutics (e.g. WHO, IUPHAR, EEC). Læs mere på EACPTs hjemmeside. 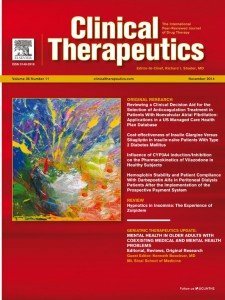 Clinical Therapeutics is dedicated to the dissemination of reliable and evolving evidence derived from clinical pharmacology and other therapeutic approaches to an international audience of scientists and clinicians working in a variety of research, academic, and clinical practice settings.